Note 1: Like football games? 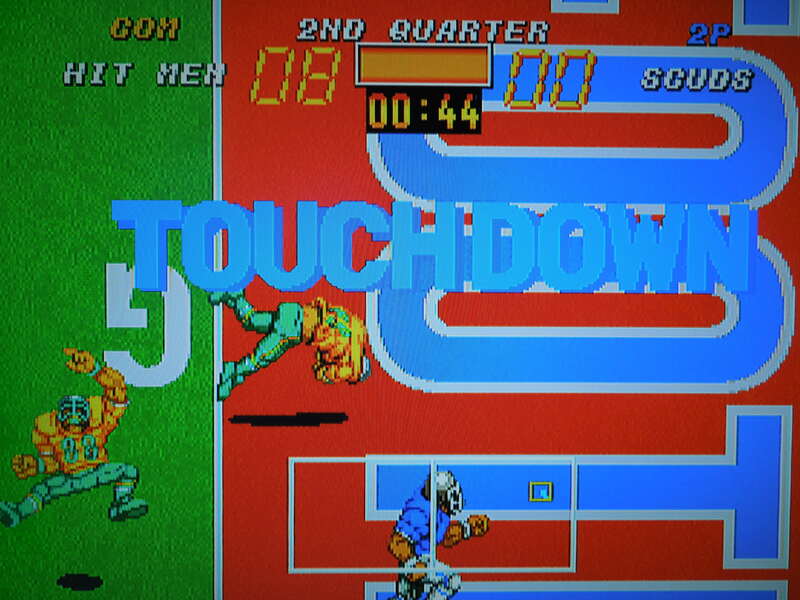 Check out my reviews of Tecmo Bowl Arcade, Tecmo Super Bowl College, Tecmo Bowl Japan, and SEC Tecmo Bowl! Note 2: This game was played on the Neo Geo Advanced Entertainment System home console. The system was modified to output in component video (red, green, blue) for improved color and picture. The system was connected to a 32-inch HD tv. 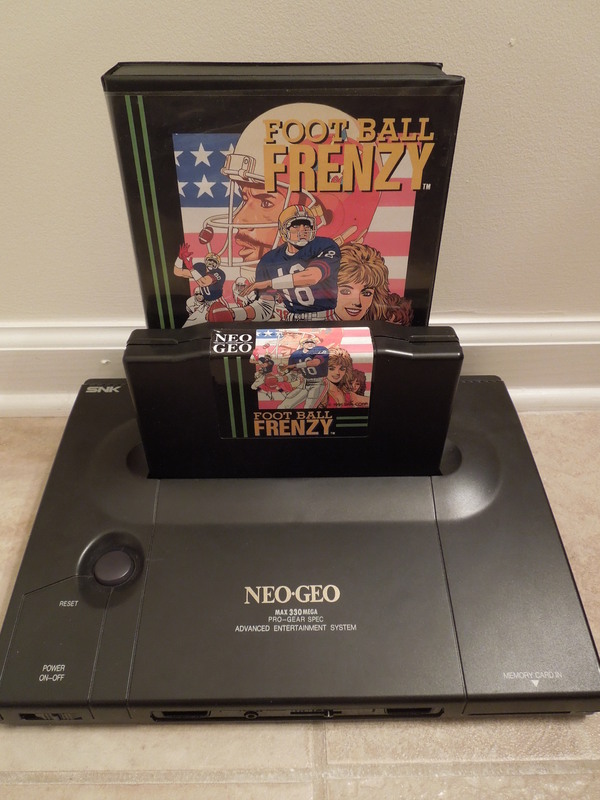 Also, Football Frenzy doesn’t really qualify as being terribly ‘obscure.’ However, since it is a Neo Geo game, and so few people owned a Neo Geo AES home console due to its outrageously high price tag when it was released in 1990, I felt the need to review it. Also, there aren’t a lot of reviews online for this game that are any good. What I could find seemed to have been written by those who hadn’t spent a great deal of time with the game, so hopefully, if you’re interested in this game, you’ll find everything you need here. Neo Geo AES game cartridges are massive, and come in large boxes. Quick History: If you know nothing about the Neo Geo AES, it is a home console that plays arcade games in the form of large cartridges. What is great about Neo Geo AES games is that every game IS an arcade game. Many of the cartridges that were created for the home console (like Football Frenzy) were also the exact same games being played on arcade Neo Geo cabinents. These games are not arcade ports, they are arcade games. The only differences were ususally the removal of the ‘Insert Coin’ titles and sometimes the addition of an options menu on the AES cartridges. There’s a lot of information on the Internet about the Neo Geo system, if you’re interested. 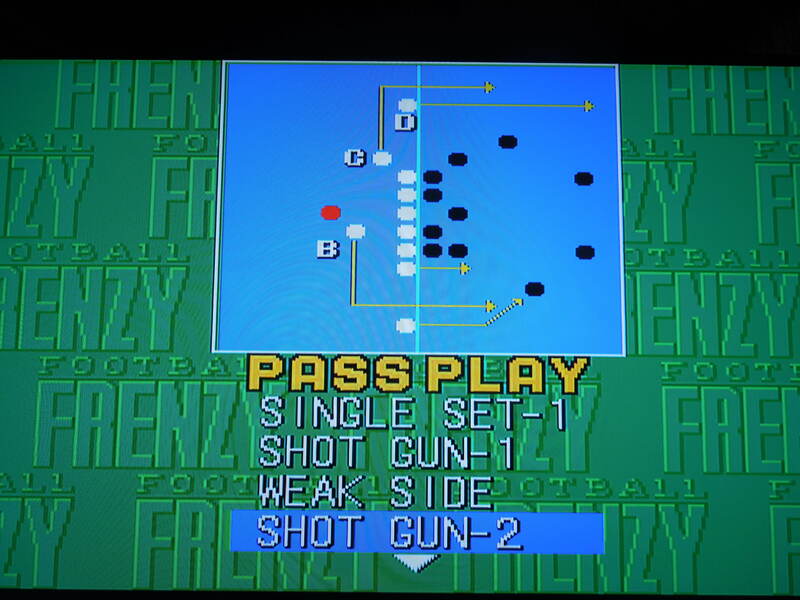 Football Frenzy was released in 1992. 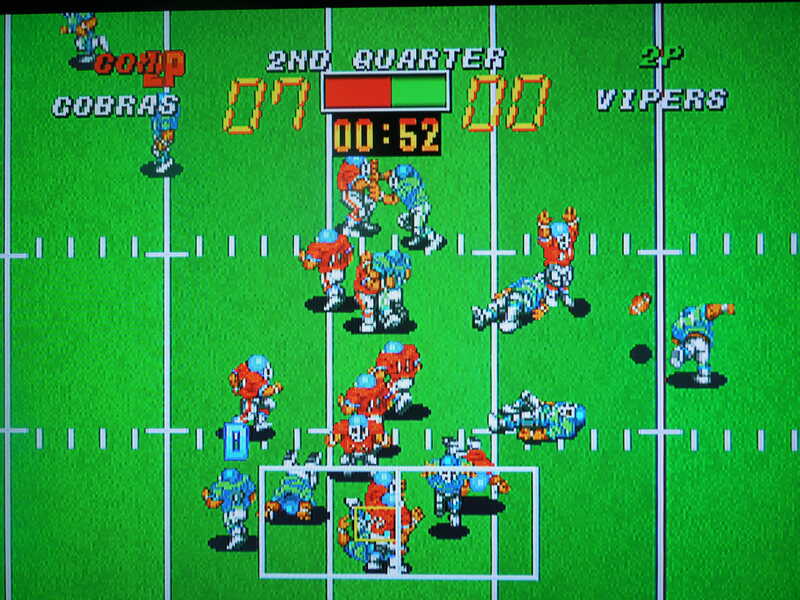 Many sports games were released for the AES, but only one Football game – and this is it. 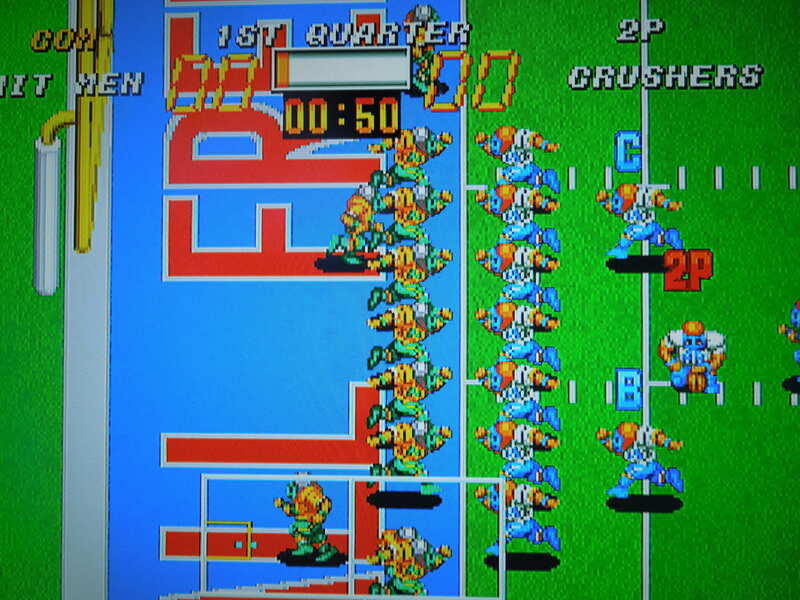 Gameplay: AES controllers are rather large, and they have an arcade-style joystick, small Start and Select buttons, and 4 large arcade-style buttons – A, B, C, and D. Football Frenzy uses all of them. On offense, the A button hikes the ball, and tapping A quickly causes your player to run faster and shed tackles easier (in conjunction with rotating the joystick 360 degrees) B, C, and D represent your running backs and receivers. After the ball is hiked, pressing any one of these buttons will pass/pitch/hand-off to the designated player. The appropriate letter will appear above the players before the ball is snapped, reminding you of what your options are. On defense, the A button makes you run faster and, according to the game manual, “increases tackling.” The B button lets you pick which defender you want to be before the ball is snapped – safety, D line, linebacker. However, unlike in other football games, you can change defensive players even after the play has started. Pressing B allows you to switch to the defender who is closest to the ball carrier, and, from what I have noticed, tapping B also increases your chances of successfully tackling the ball-carrier (not A). C and D have no function on Defense. Select pauses the game, like in most Neo Geo games. 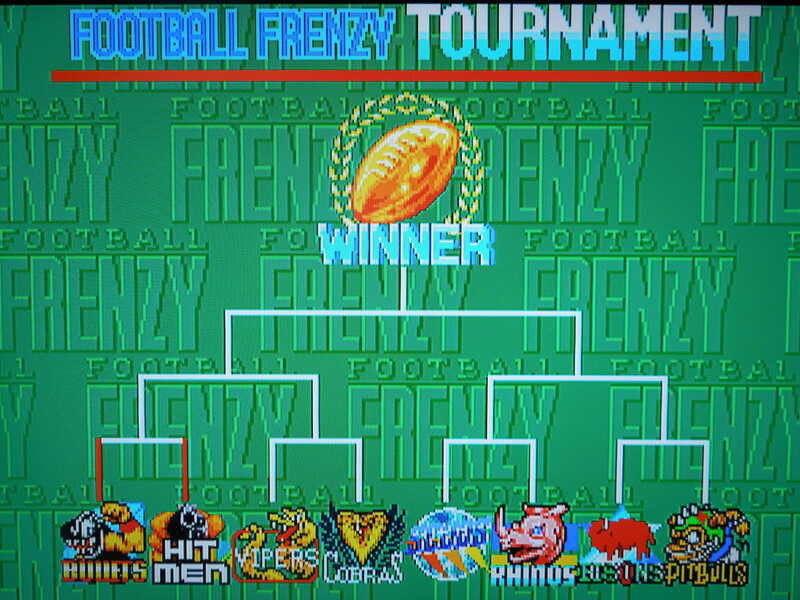 There are 10 fictional teams to choose from in Football Frenzy: Bullets, Bisons, Cobras, Hit Men, Pitbulls, Rhinos, Crushers, Vipers, Wolves, and Scuds. Each one has it’s own unique emblem. My friend pointed out to me that ‘Bisons’ is grammatically incorrect, as the plural of bison is actually still the word ‘bison.’ No ‘s’ is needed. Many Neo Geo games haves spelling errors, you’ll find. 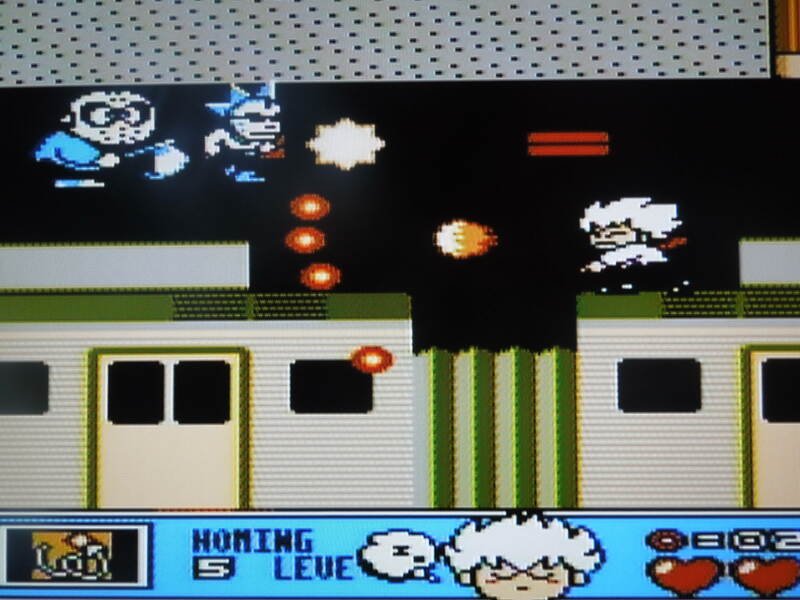 The game manual states that there are differences between the teams in terms of speed, tackling abilities, etc. For example, for the Bisons, it reads, “High-speed receivers are the strengths.” However, having played through the game with all the teams, I have noticed little to no difference between them. I like to use the Crushers, because it does seem like they are a little faster than some of the other teams, but again, if there are differences, they are minimal. Each team has a different colored uniform, mostly with a combination of two or more colors. The Crushers are blue and gold and white – they look like the UCLA Bruins. Each team has 8 pass plays and 8 run plays to choose among. On offense, you get to choose your plays. Each team has 8 run plays, 8 pass plays, and 2 kick plays (Punt or Goal Kick). When you highlight a play, a graphic pops up showing you what routes your receivers/running backs will run, allowing you to make a good play decision based on the down and distance you’re facing. You do not get to choose any plays on defense. Instead, you will be placed into one of a handful of seemingly random formations. Being able to pick your defender and switch defenders after the play has started helps to counter-balance the lack of a defensive play selection. 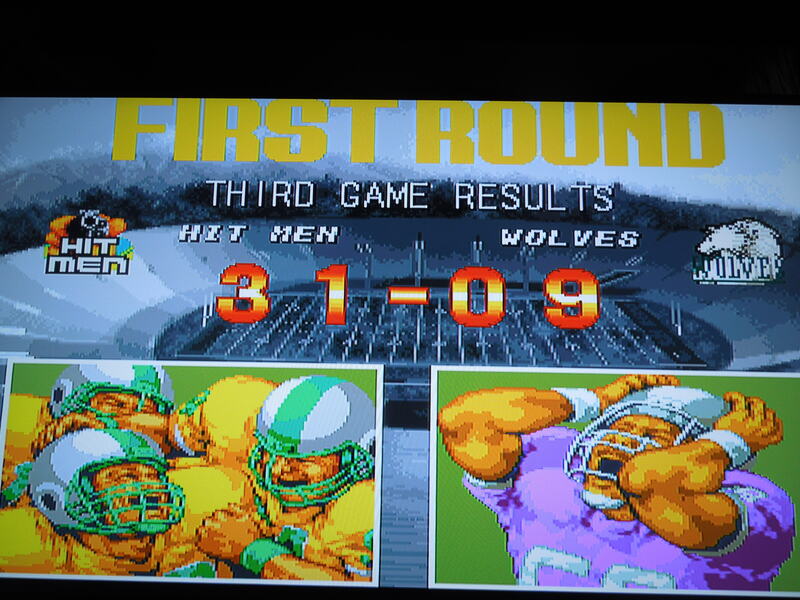 In 1 player mode, after you select your team, then select the difficulty level and the time limit for each quarter, you enter an 8-game playoff tournament, culminating in the SNK Super Bowl. So, essentially, your season is 3 games, assuming you keep winning. Between the 1st and 2nd games, you’ll be asked if you want to watch the other playoff games. If you select ‘Yes,” keep in mind that you have to watch the entire game. Selecting ‘No’ to this question will skip the game and show you which team won and advanced. If you have a Neo Geo Memory Card, you can save your progress after every quarter of each game, allowing you to turn off the system and continue later. For each of your 3 games, the playbook for your team will change, forcing you to change your playing style for each game. Teams get increasingly more difficult as you advance in the playoff, regardless of what difficulty you selected. You always start on offense in 1 player mode. In 2 player VS, each player selects their team, followed by a coin toss that determines who kicks off and who returns. A key difference I’ve noticed in 2 player VS is that your playbook changes during the actual game instead of staying the same the entire time. For example, you may not have access to the ‘Quarterback Sneak’ play in your playbook when you start your offensive drive, but when you get inside the 5, that play will appear, replacing one of your other running plays. I like this addition to 2 player VS. After 4 quarters of play, the team with the most points wins. There is no overtime, so if both teams have the same number of points, the game is a draw (meaning you don’t advance in 1 player mode – essentially, a draw is a loss). Break tackles and run faster by tapping A. Sound and Music: The music for Football Frenzy is terrific – quick and catchy. The music that plays for scoring a touchdown or making a field goal will make you feel like you’re the most talented player ever. The sound effects, however, while not bad, could have used some improvement. Specifically, tackling needs something more than the almost non-existent sound that you hear when you bring down a ball-carrier. All in all, the music is above average, and the sound is average. Control: While choosing your plays, throwing to receivers (whom you control as soon as you throw the ball), and controlling the offense is easily done, it can be a little frustrating on defense trying to tackle. The controls might best be described as ‘loose’ when you’re playing on defense, and sometimes, you’ll end up running right by the ball-carrier and finding yourself having to circle back around to make the tackle. You will, occasionally, find yourself cursing for missing a sure-fire tackle for loss or letting a receiver pick up an extra 10 yards because you couldn’t get a hold of him. Options: You can choose among 4 game quarter lengths: 1 min, 30 sec, 3 min, 5 min, and 10 min. Keep in mind that the clock moves rather quickly, and runs even before kickoffs and during extra point attempts or 2 point conversions. It does stop after every play, however. You also have 4 difficulty settings – Easy, Normal, Hard, MVS (Arcade difficulty – somewhere between Normal and Hard). You can win the playoff tournament on any difficulty with practice, but on Easy and Normal you’ll have an easier time as you’ll be able to break more tackles by tapping the A button. You’ll need to be good at scoring on Hard because the computer is a scoring machine in the tournament, and you’ll often be in a shoot out or getting blown out if you can’t keep up with them. Half-time shows feature cheerleaders and either a bulldog or alligator mascot – neither of which belong to any team in the game. Graphics: Superb. 11 on 11 football, just like it’s supposed to be. All of the teams have different colored uniforms, clearly distinguishing them. The running animations, catching, and somersaulting into the enzone on touchdowns are all great. The only complaint I have is with the QB. His throwing motion often looks ridiculous. The game has a rowdy crowd and the field has two huge ‘Football Frenzy’ logos on it, complete with grinning bald eagle. Scoring a touchdown pulls up large graphics of celebrating offenses and dejected defenses. A large graphic of a referee pops up signaling kickoffs, touchdowns, and field goals. Scoring: Every way to score in football is included in this game. Touchdowns, PATs, 2 point conversions, field goals, and safeties are all here. I have also blocked a PAT before and picked up the ball and taken it in the opposite direction, ALMOST taking it all the way back for a 2 point score. I can’t confirm if I would actually get the 2 points that way, but I assume it’s possible if you make it to the enzone. Kickoffs, Punts, & Field Goals: A ‘power meter’ determines the length of your kick. Tapping A as fast as possible fills the meter. Touchbacks are not possible on kickoffs; however, if you punt a ball through the endzone, a touchback will occur, causing the offense to start their first play on their own 20 yard line. If you are receiving a punt, start rapidly tapping A as soon as the ball is kicked. Your punt returner will run VERY FAST as soon as he catches the ball, making punt returns for touchdowns possible, although difficult. Making field goals seems to be based on percentages; if you are within the 20 yard line, you’re more likely to make your kick (assuming you filled your power meter). If you’re outside the 20, it seems like your chances are not as good, and you will miss more than you make. Free Kicks: If you record a safety (tackle the opposing team’s ball-carrier in his own enzone – your team gets 2 points), the other team will not kickoff to you from a tee as they normally do. Instead, they’ll have to do a standing punt, called a Free Kick. You’ll usually catch this kick in a better position than you would a regular kickoff. You’ll do the same if you get get tackled for a safety. The computer will block approximately 50% of your PATs and field goal attempts. The Computer: The computer can be cheap in several ways, regardless of the difficulty setting you selected. They go for 2 following a touchdown about 60% of the time, even when it doesn’t make sense for them to. And because you don’t get to select a defensive formation, they end up getting it more times than not. When they do select to kick the PAT, however, you can often block the kick by busting through their line and throwing your player in front of the ball – the same strategy applies to field goals. The computer can also block your kicks, and from my experience, they will block approximately 50% of your PATs or Field Goal attempts. 50%!!! This means you’d better think about going for it on 4th down and short sometimes, or going for a 2-point conversion yourself, since it can be easier to get than the 1 point. On the Hard difficulty setting, beware, the computer’s players have super-human strength, making them extremely hard to tackle. You’ll need to rely on going for interceptions or out-scoring them. 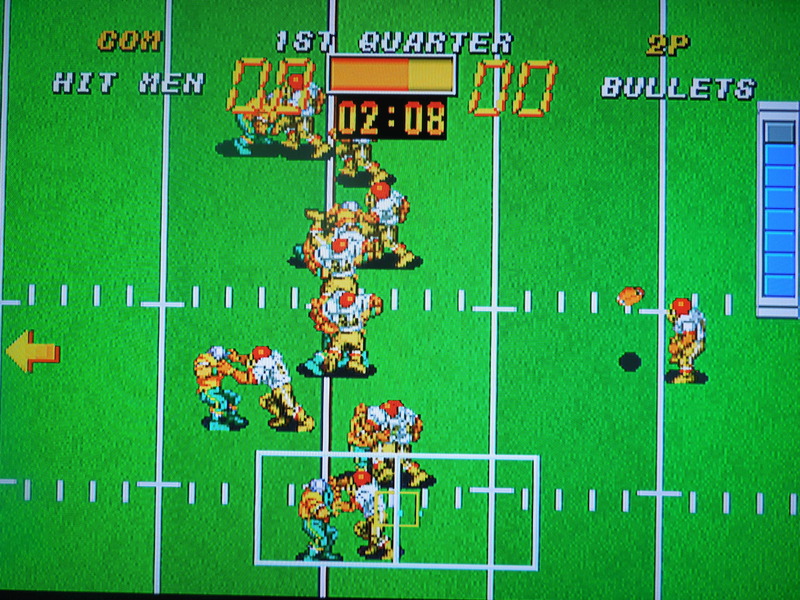 Players often somersault into the endzone for touchdowns. Glitch # 1: I have noticed two huge glitches in this game. The first, and this works to your advantage, is the fact that you can PUNT for field goals! Once, when I had the ball 4th and 10 and meant to select ‘Goal Kick’ (Field Goal), I accidentally selected ‘Punt Kick.’ I was shocked when the ball sailed through the uprights and the graphic with the referee popped up proclaming ‘Field Goal!’ and awarded me 3 points. The only time I’ve missed a punt kick field goal is when I was too far out of range for the ball to make it to the goal posts. Any time I’ve been in close, I never miss. Also, the computer doesn’t seem to be able to block my punt kick field goal attempts like they so easily can my regular field goal attempts. Technically, this may not be a glitch, as there is an antiquated but still legal way to score a field goal or PAT in football called a ‘Drop Kick,’ wherein the kicker drops the ball and tries to kick it through the uprights after it bounces off the ground. Maybe that’s what’s happening here. Glitch # 2: If a ball is punted to you, you are automatically assigned the kick returner player, and will not be able to move until the ball gets to you. However, if you press B while the ball is in the air, you gain control of the player, and can run around, causing you to miss the ball. The ball will bounce around when it hits the ground, and if it goes out of bounds or when it stops bouncing, a whistle will be blown. Now, in such an event in real football, the offense should start their possession where the ball went out of bounds or was blown dead. Instead, however, the offense starts their possession from where the ball was punted from! This is a cheap way to take advantage of punting situations, but I don’t encourage it when you’re playing with a friend. You play an 8 Team Playoff to determine the SNK Super Bowl Champion. Win 3 games and you beat the game. Turnovers: Interceptions and fumbles are both possible. To make an interception, simply position your defender in front of a receiver when the ball is thrown to him. Sometimes you’ll come up with a pick, sometimes he’ll still catch it, or sometimes the pass will be incomplete. Fumbles can happen if you pitch back to a running back and you move him before the ball gets there. Fumbles also happen if you take a big hit (or deliver one on defense) immediately after a receiver catches the ball. The computer will do this to you a lot, so be careful when you throw a ball over the middle – even if you’re receiver is open, if there’s a defender near him, he’ll often hit him as soon as he catches the ball, dislodging it and causing a fumble. Fumbles can be picked up and advanced by the defense, but only if you grab it quickly after the words FUMBLE appear on the screen (while it’s bouncing around). Otherwise, you can only recover it from the spot where it stops. Laterals: You can perform half-back passes and other trick plays if you lateral. For example, if you selct a play where you have to lateral the ball (tossing the ball to a running back behind the quarterback), then the player who catches it still has the option to throw a forward pass to a receiver downfield. It’s a great way to stick it to the computer. Fake Field Goals and Punts: If you select to punt the ball or try for a ‘goal kick’ (field goal), sometimes the graphic that accompanies the play selection shows receivers marked B, C, or D running routes, as if your kicker or holder could throw the ball to these players. Sure enough, when the punt play starts, these players DO run those routes! Unfortunately, I have never been able to execute a fake, as my kicker will always only kick the ball no matter what button I press, thus leading me to believe that you cannot attempt a fake field goal or punt, even though these plays seem to have been designed for this. Maybe the game designers forgot and left this option out. Sad. The computer, however, can and will execute fake punts, field goals, and even PATs for 2 points, so be aware. Tap A to build up your kicking meter for punts, kickoffs, extra points, and field goals. UPDATE: After watching the ‘Kick 6’ in the 2013 Iron Bowl, where Auburn University’s Chris Davis returned a missed field goal 109 yards for a touchdown on the last play of the game against Alabama, I wondered if this was possible in Football Frenzy…it is!! Well, kind of. On field goal attempts, if the ball comes up short, you can field it and return it! However, instead of having a kick returner in place on the attempt, you have to manually select a player and start running him toward the endzone when he ball is snapped. If the attempt comes up short, you’ll easily have enough time to catch the ball and return it. However, if the ball comes down short in the endzone, and you catch it, you won’t have a chance to return it because it will be ruled a touchback. Playing around with this in 2 player mode, I managed to return several missed field goals from the 1 yard line and returned a few as far as my opponent’s 20 yard line. I haven’t quite made it to the endzone, but it’s definitely possible! Where can I find this game? You can find AES cartridges on ebay, as well as MVS cartridges (that are used to play in arcade cabinents). 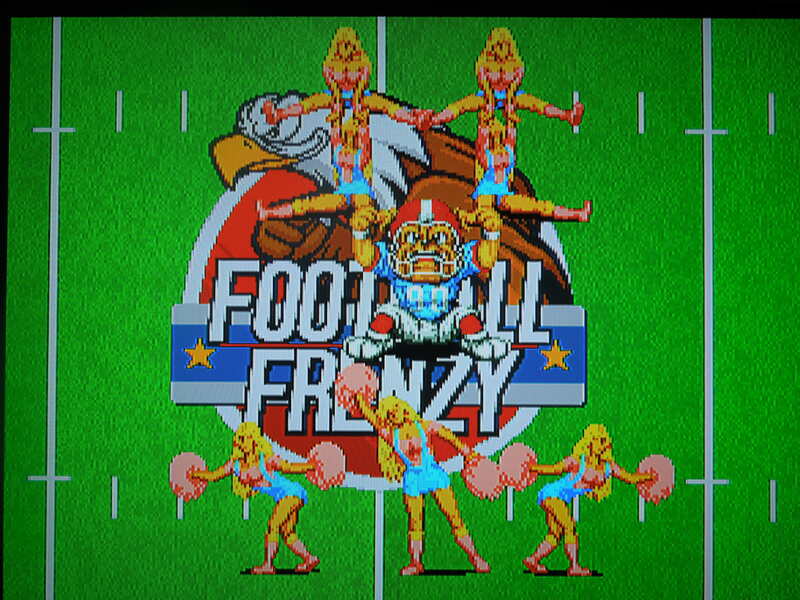 Football Frenzy was also released for the Neo Geo CD. It’s the exact same game, but I believe it’s avaliable only in Japanese format – however, the only part of the game in Japanese, I believe, is the name of the plays. And since there is a graphic demonstrating each play, this probably doesn’t cause any frustration. The game is also avaliable for computer emulators of the Neo Geo. Conclusion: I have spent a lot of time playing Football Frenzy, but it is not a perfect game. 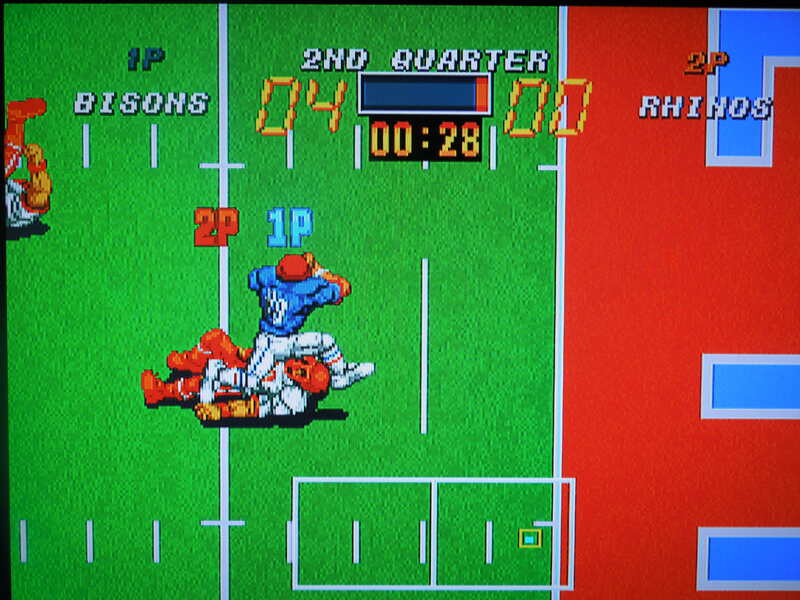 Although it looks a lot like Tecmo Bowl, it’s really a different beast. The loose control on defense, the inability to select defensive plays, the sometimes cheap computer antics, and the often lacking sound effects all could have used improvement. BUT, even with all of that, the game is still extremely fun. Busting up the middle and running over linebackers is great fun, as is throwing a deep ball to your receiver and having him take it for 6. 2 player VS is great fun as well. There is replay value in trying to beat the game on each difficulty setting in 1 player mode. Animated cutscenes play following touchdowns and field goals. This entry was posted in Neo Geo - Football Frenzy and tagged Football Frenzy Review (Neo Geo AES). Bookmark the permalink. Cheers for the review matey. I like this game even though it has a few flaws. Good tips too. I wish we could hook up with a 2 player. Most appreciated. Thanks! Glad you liked it! It’s really a great football game that many people have never heard of and even fewer will really give a chance to. Yeah it was a great review. I have the game on my MVS but have just bought the euro version for my AES after waiting a long time to find it, years in fact. I’m actually from the UK but love american football. Hoping the Seahawks win the SB because Russell Wilson is my favourite QB at the moment and my teams are not in contention.